Portsmouth Public Library is a library in Portsmouth, New Hampshire. Established in 1896, the library's mission is to provide popular media materials to the public as well as to supply information and access to reference works. It also does community outreach, attempting to provide services and material to foster an appreciation for reading and learning in youth as well as offering activities engineered to appeal to older demographics. The library is open 6 days a week, from 9-9 Monday through Thursday, 9-5:30 Friday, and 9-5 on Saturday. It hosts computer stations with a variety of applications and library databases, as well as internet access. The building and its immediate grounds provide wireless access as well. It also provides printing and copying services. The library, which is handicapped-accessible, contains three larger meeting rooms available to the public as well as three smaller study/conference rooms on the premises. It has seating areas scattered throughout. The library includes a cafe. The new library, an $8 million dollar construction project formally dedicated in January 2008, has Leadership in Energy and Environmental Design (LEED) certification from the U.S. Green Building Council. It is the first municipal building in New Hampshire and among the first public buildings in New England so certified. According to the Portsmouth city website, the library scored "high marks in the areas of energy conversation, recycling, building material|materials selection, and |daylight and views. Here's the our members favorite photos of "Libraries in Portsmouth". 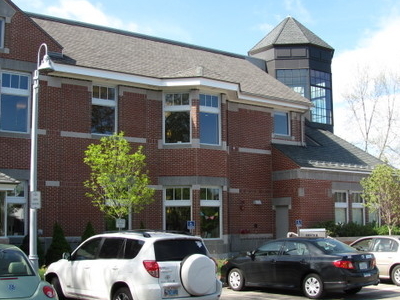 Upload your photo of Portsmouth Public Library!